PGiA integrates legislative requirements from Great Teaching Inspired Learning, The NSW Education Standards Authority (NESA) and National Education Reform Agenda, including use of the Australian Professional Standard for Principals, the Australian Professional Standards for Teachers, the Australian Charter for the Professional Learning of Teachers and School Leaders, and the essential elements of the Australian Teacher Performance and Development Framework. Provides for cohesion of processes and activities in performance and development including; staff performance and development, contract renewal, Onboarding, Teacher accreditation and staff professional career development. Supports deep reflection and critical dialogue around performance and learning with a focus on continual improvement. Aligns the improvement goals of the school/directorate/team with the performance goals of the individual. Reflects and supports a deep commitment to the Catholic values of work (Catholic Social Teachings) and the promotion of schools as authentic Catholic schools. Is an informative and positive development experience for staff. It is not performance management. Recognises that Teachers have a powerful effect on student learning and that targeted teacher professional learning has a direct link to student learning. Recognises that adult learners, have an interest in and take responsibility for their own professional learning and growth. Is informed by a clear and relevant role description, standards or measures of success in role e.g. Australian Professional Standards for Teachers, Growth Maps. Is for all staff to grow and improve in role and target areas of learning as pathways for career development. Allows goal achievement to be flexible in form and time dependent upon the scope of the goals and the experience of the person. Requires effective Onboarding and mentoring relationships which, in a school context, supports early career teachers development to proficiency. Should be customised to each staff member's context, role and learning needs. Is informed by data, supported by a range of evidence of effectiveness and impact and supports peer conversations in a process that is honoured through time and preparation. PGiA supports system and school leaders to create a culture of continuous feedback, establish formal processes for review and for individual and peer reflection. 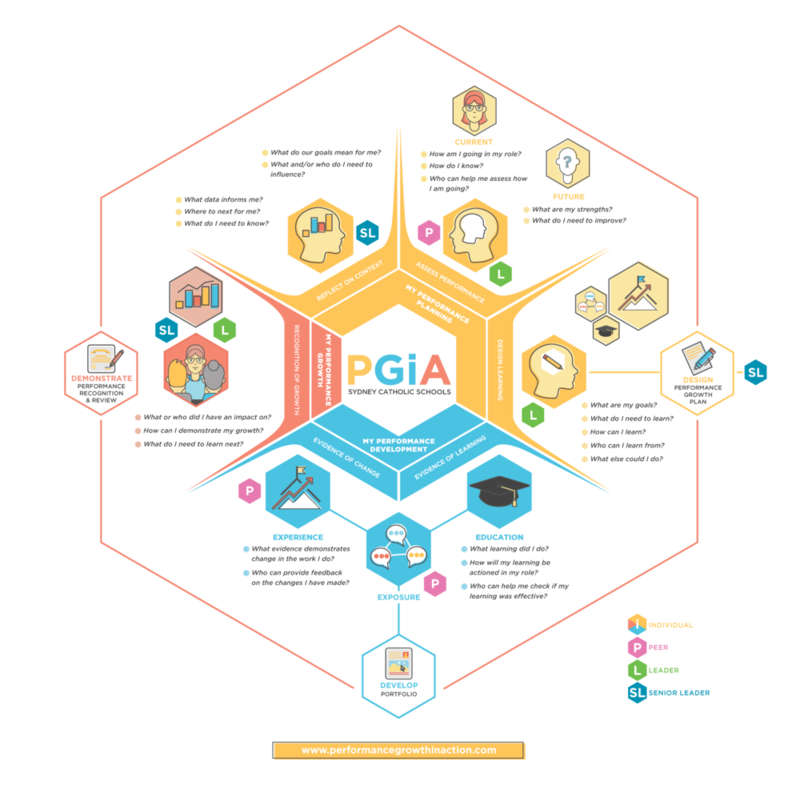 Personal and professional growth is a shared responsibility and as such there are four roles that make PGiA a successful growth model. Click to explore how the roles intersect to support the development of the individual. AITSL InSights. Riley, P (2013) Literature review: Learning leaders matter. Fullan, M and Hargreaves, A (2013) The Power of Professional Capital - with an investment in collaboration, teachers become nation builders. Hattie, J. (2015) What works best in education: The Politics of Collaborative Expertise. Pearson Education. Leading Teams Australia (2013) Strong Professional Relationship Drive High Performance (Slides). Paper can be downloaded by request via the Leading Teams website. NSW Government. Great Teaching Inspired Learning - a Blueprint for Action (2013).